Over the Hedge, Avril Lavigne Movie. 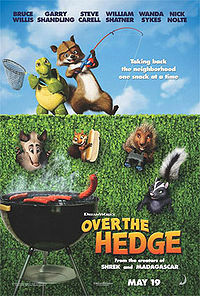 Over the Hedge is an animated United States based on the comic strip of the same name. The film was directed by Tim Johnson and Karey Kirkpatrick and produced by Bonnie Arnold. The film was released in the United States on May 19, 2006. PLAYERS is Bruce Willis, Garry Shandling, Steve Carell, William Shatner, Wanda Sykes, Nick Nolte, and Avril Lavigne.